In this powerful new self-help program, Wright and Basco show you how to blend the best methods of scientifically tested treatments to win the battle against depression. By following their step-by-step instructions, you will be able to develop a Personal Plan for Recovery that you can use to get well and stay well. The flexible plan lets you learn about and master the Five Keys to Recovery in the sequence that's best for you. Some people may want to work through all five keys; others may find they are able to achieve the level of health they want with just a few. Whether you learn the self-help strategies of cognitive-behavior therapy, rely on prescription antidepressants, try herbal remedies, work on mending relationships, focus on spiritual growth, or use a combination of methods, the Personal Plan for Recovery is a breakthrough tool that allows you to take control of your own treatment. Conversational and filled with guided exercises and strategies that work, Getting Your Life Back is an empowering book that maximizes each person's strengths and potential. When you've been feeling down for a while, it's easy to get discouraged. You can begin to doubt that life will ever get easier, that the pain will cease, that the frustration will ever stop. You might think that if you can only figure out how you got this way, you could shake loose from it. So you blame it on your job, your spouse, your weight, your mother, or yourself; but those conclusions don't make you feel any better. In this book you will find answers to your questions about what makes you depressed and keeps you down, as well as specific instructions for how to find your way out of it. The fact that you are seeking a way to greater well-being is a sign that somewhere deep inside a bit of optimism remains. Hold on to that hope and use the Five Keys we present in this book to help unlock the door to your depression. During our years of clinical practice, we have seen many people recover from depression. Each, with a unique story to tell, has taught us something new about how to overcome adversity. We have found time and time again, that even when all they were able to see were their weaknesses and flaws, our patients were able to learn how to call upon their unique strengths to fight off the symptoms and get their lives back. In some cases, they became even stronger after getting well than they were before their problems began. You'll meet some of these people in this first chapter and find out how they got started to overcome depression. Michelle had thought her life was going well. She had two wonderful kids, a husband she thought loved her, a good job, close friends, and a home she took pride in. When her husband announced one day that he had fallen in love with someone else, Michelle felt her entire world come crashing down around her. Everything she believed in had failed her. She had failed herself. And now, as she watched herself become more and more withdrawn, losing her connection to all the things that mattered, she knew that she was beginning to fail her children. I don't know what happened. It seemed that everything was going fine and then he dropped that bomb on me. At first, I thought I could handle it, but as the weeks have gone by, I've seen my life slipping away from me -- my kids, my friends, my self-confidence, and my hope. I feel so ashamed. This is how Michelle described herself when she began treatment after several months of worsening depression. She had stopped sleeping well at night, had dropped some weight, was having trouble concentrating at work, and seemed to have lost her zest for life. Michelle was nothing like the woman she had been before her husband left. She had stopped singing in the church choir, quit exercising with her friends, couldn't concentrate well enough to read a book, and gave up altogether on the weeds that threatened to overtake her beautiful garden. These kinds of things aren't supposed to happen to me. I'm not the kind of person who gets depressed. I'm supposed to be the strong one. It's so humiliating. Look at me. I look horrible. I know it's ridiculous to let a man bring me down like this. But I can't help it. It takes everything I've got just to make it through the day. I don't think I'll ever get over this. Michelle's hopelessness was a symptom of her depression. When her friends and family members looked at her they saw the strong woman who put her husband through school, raised two healthy and happy children, had a deep sense of spirituality, and brought joy into the lives of many people. But, Michelle saw herself as pathetic, weak, and unable to cope. Her friends knew that the real Michelle had only been knocked off her feet -- she had not been defeated. When we see this type of situation in our clinical practices we try to help people look through the curtain of hurt and pain to find their real selves, and then to build on their strengths to defeat depression. The self-help exercises we offer in this book are based on cognitive-behavior therapy (CBT), a well-known, and scientifically proven, method of treatment. We'll show you how to use CBT methods when you learn the details of the Five Keys to Recovery. The goal of CBT is to help people gain a more realistic view of themselves and their world, and to take action to solve their problems. This is one of the ways we helped Michelle. Medical breakthroughs, particularly over the past ten years, have led to newer and safer pharmacological treatments for the symptoms of depression. These medications can be extremely effective when used as prescribed. Since Michelle had both the physical and psychological symptoms of depression, she opted for a combined treatment approach using both antidepressant medications and psychotherapy. Throughout this book we will show you how to integrate effective psychological and biological interventions, along with those that help you develop healthier relationships and strengthen your spirituality, so that you can leave your distress behind. Depression doesn't always cause as much pain and misery as Michelle experienced nor does it always require professional treatment. But, everyone who becomes depressed notices definite changes in his or her attitude, mood, and ability to function. Even if you have a mild depression, you'll not be your usual self. It will be harder to get things accomplished and to enjoy life. Your sleeping and eating habits may not be as regular as normal. You may be tense, irritable, or restless and you may tend to think very negatively about yourself and have pessimistic thoughts about the future. When you are feeling down, your mind can be so preoccupied with worries that it's hard to remember the good times or to think of new ways to fix your problems. You might even miss out on opportunities to change your life for the better. In this book, we want to open your mind to new possibilities that will help you not only to feel better, but to grow in positive ways. Jeff did this by overcoming a mild depression and making some positive life changes. "I just didn't feel right. I used to get a big kick out of teaching, but something changed and it became a real effort to act like I wanted to be there. I was still doing a decent job. But, I wasn't having any fun, and I started worrying about getting fired. My home life wasn't any better. It seemed like I was just going through the motions. My wife said that I was edgy and irritable with her and the kids. I'm sure she was right. I had to do something about it before it got worse and I turned out like my mother." Jeff remembered his mother's struggle with depression and knew that these things often ran in families. He had always been a do-it-yourselfer, so he decided to read some self-help books and try to work his way out of his slump. As he read, it began to make sense to him that his problems had probably been there, to some extent, for several years. Although he'd been told that he was a good teacher, he'd always had his doubts. He realized that this recent downturn began after a job evaluation that didn't meet up to his usual standards. After reading about low self-esteem, Jeff concluded that he had probably always been his own worst enemy. He had been a good teacher for the last twenty years, but he kept telling himself that he wasn't as good as others, particularly the younger teachers coming out of school still perky and enthusiastic. Despite the self-criticism, he had always done well with his students, and had even received an award for being one of the top teachers in his school district. He decided that it was time to stop torturing himself. There was more to life than trying to be the perfect teacher. Now I think I know what really counts for me and my family. I've tried to start enjoying all the good things I have in my life instead of always comparing myself with everyone else. I've noticed a big difference. I'm really enjoying going to work and being with my family again. Although depression can sometimes make you feel overwhelmed or helpless, there are many things you can do to cope with your problems. This book is full of exercises that can help you gain control over your emotions and your life. These are the same types of self-help exercises we give our patients in our clinical practices and the same exercises that have been used in research studies on depression. We also usually recommend professional help when there are symptoms of depression that are causing significant distress or don't go away. We'll talk later in the book about how to find a doctor or therapist to help you put your recovery plan into action. As you work through the exercises in this book, we'll help you build a Personal Plan for Recovery. You'll be able to design a plan to address your own particular needs, take advantage of your strengths and opportunities for change, and help you resolve your problems. The core of your plan will be to learn to use the Five Keys to Recovery. We'll show you how to make best use of each Key and how to choose the Keys to use first. Our patients usually find it helpful to have a notebook on hand to work through the exercises and to jot down ideas as they go along. We suggest you read this book with a notebook or diary nearby. Your notes will help you keep track of your progress and will serve as a written account of the path you've taken to a better life. Although each person's personal story is unique, there are some common themes that thread their way through the lives of most people who become depressed. The Five Keys are directed at these common clusters of problems. We'll introduce you to the Five Keys in this chapter and give an example of how Michelle used each of them to fight depression. As you read along, you may find some similarities in your own life. At the end of the chapter we will ask you to begin to think about how each of the Keys might help you overcome your depression. When you are feeling low, it is easy to slip into a negative style of thinking. Angry, upsetting, fearful or self-critical thoughts are some examples. They typically fuel your unhappiness and lead to actions that can make matters worse. If you find that you tend to get down on yourself, have excessive worry, or think pessimistically about the future, you can use the Thinking Key to learn methods to control your negative thoughts and solve problems more effectively. Research on the treatment of depression has shown that when your thought patterns become less negative and more accurate or rational, your mood brightens and your symptoms get better. If you can learn how to spot depressive thinking and change it in a healthy direction, you can take some very important steps toward getting your problems under control. Did you notice that Michelle's thinking had a hopeless tone? The more she saw things this way, the worse she felt. To get back to a more balanced view of her self-worth and her prospects for the future, Michelle learned to spot her distorted thinking patterns and to correct her negativity when it was inaccurate. She also learned to take stock of the strengths and abilities she had forgotten that she possessed. As she mastered the methods offered in the Thinking Key, her natural optimism returned and she felt more hopeful about her future. You will learn to use these same techniques in Chapters 3 and 4. When you feel depressed, you can't help but act differently at home, at work, or in your relationships with others. You can lose interest and be less involved in your usual activities, develop negative habits, procrastinate, or show too much irritability. Jobs that might have been routine or effortless can become so difficult or unpleasant that you have to push yourself to get them done. You might even avoid some of your responsibilities altogether. If your actions have changed in any of these ways, you can use the techniques from the Action Key to learn to take pleasure in life again, cope more effectively with problems, and become more energetic. When you begin to act in positive ways, you will feel better about yourself, and your depression could start to fade away. Michelle had several good opportunities to use the Action Key. For example, when she avoided her friends and dropped out of social activities she felt more lonely and isolated. As a result, her mood worsened, and she became even more depressed. This was unlike the old Michelle who had always enjoyed being with people. She used the Action Key to figure out how to begin acting more like her old self. 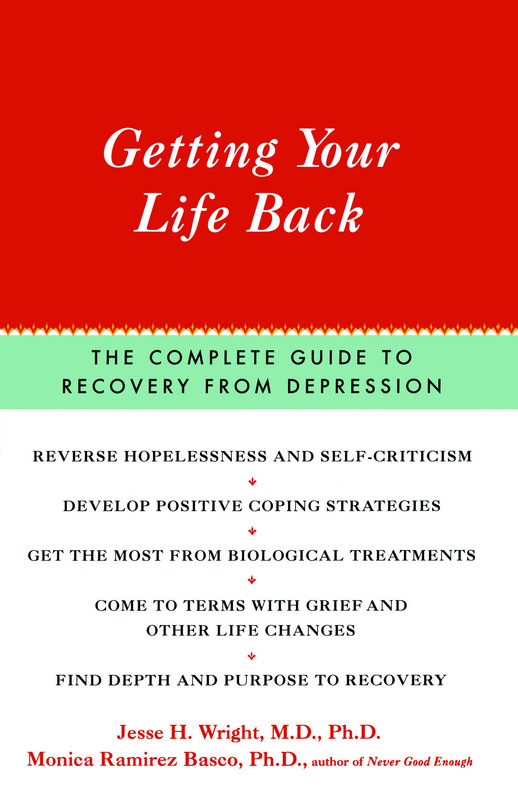 Michelle's recovery plan included use of several of the self-help methods described in Chapters 5 and 6, such as learning how to experience pleasure again, combating fatigue and lack of motivation, organizing her day to be happier and more productive, and getting back her sense of humor. She started with small goals for change. But as she began to improve, Michelle was able to tackle more challenging problems like being assertive in handling the legal side of her divorce. Scientific studies have provided convincing evidence that depression can be effectively relieved with biological treatments. In Chapters 7, 8, and 9 you'll find out how your brain chemistry is involved in producing depressive symptoms and how to promote recovery in two major ways: (1) modifying your life-style to stimulate healthy chemical processes in your body, and (2) using specific biological treatments such as antidepressants, herbal remedies, or light therapy. The Biology Key will help you decide whether or not to use medications or other biological interventions as part of your recovery plan. If you decide to take medication, you can learn how to limit the risk of side effects and get the most out of treatment. The Biology Key was an important part of Michelle's recovery plan. She began taking an antidepressant medication early in her treatment. Both she and her doctor believed that the medication helped a great deal in relieving her symptoms. She also used techniques from the Biology Key to improve her sleeping and eating habits, and to get back into an exercise routine. As Michelle gradually got back into a healthy life style, she had more energy, and felt better about herself. Research studies have repeatedly proven what common sense tells us -- relationship problems can be stressful and depressing. The Relationship Key focuses on teaching you how to identify problems in your relationships and take action toward making improvements. Even if your relationships are strong, you can use the methods in the Relationship Key to improve your communication, resolve conflict, eliminate resentments, and create more intimacy. Positive and caring relationships can be a tremendous help when you are trying to recover from depression. There are several things you can do to help create and nurture loving and supportive connections with others. A crisis in her marriage was the main trigger for Michelle's depression. In Michelle's case it was too late to save her marriage. Instead, she needed to grieve the loss and find a way to strengthen the other important relationships in her life. Techniques from the Relationship Key (described in Chapters 10 and 11) helped her cope with her loss, focus on positive elements of her life independent of her marriage, and set positive goals for the future. One of her greatest assets was her close relationship with her children and friends. As Michelle succeeded at re-building these relationships, the feeling of emptiness that initially fed her depression disappeared. Lack of a sense of meaning in your life or feeling spiritually empty can be a breeding ground for despair. Drawing strength from having a purpose and being committed to your core values and beliefs can help you face depression and work on putting your life back together. The Spirituality Key will help you find meaning in your daily existence, and perhaps strengthen your faith, by teaching you ways to rediscover your lost spirituality, calm your mind, and open your heart. Elements of spirituality that cut across cultures and religious faiths and practices are discussed along with suggestions for defining your own sense of spirituality. The Spirituality Key was a big help to Michelle in overcoming her depression. It helped her to regain hope for the future, brought her back to her faith community, and strengthened her sense of purpose. Michelle's divorce and subsequent depression, though seemingly life shattering, gave her an opportunity to redefine herself, reevaluate her beliefs, and rediscover the things outside her marriage that gave her life meaning. We hope that these same methods that are offered in Chapters 12 and 13 will help in fighting off your depression and in adding new dimensions to your life. Are you getting some ideas about how the Five Keys to Recovery might apply to you? The following table summarizes the problems that can be addressed by each Key. Read through the list and think about which Keys you might want to learn how to use. The exercises in this book are geared toward helping you develop a skill, sort out your feelings, set goals for recovery, and work toward making improvements. It can be easy to read through a book like this and think about how the various methods might be helpful to you. It is a different story altogether to put these ideas into action so that they begin to work. Therefore, we encourage you to not rush through reading the book, but to take time to complete those self-help exercises that might be applicable to the problems you are facing. The first exercise will be to begin telling your own story. Take out your notebook and write out your answers to the following questions. Using Michelle's story as a guide, fill in as many details as you can. Open your notebook and title this exercise "My Story -- The Beginning." The goal is to think about how your depression began, what has made it get worse or better, and how you might begin to change. 1. When did your depression begin? 2. What symptoms or problems bother you the most? 3. What seems to trigger your depression? 4. What usually seems to help? 5. How has your life changed since you have become depressed? 6. What have you started doing since you have been depressed? 7. What have you stopped doing since you have been depressed? 8. What ideas do you have now for changes that could be made to improve your situation? Here's the next step. Go back over your story and circle all of the difficulties you are experiencing that could possibly be addressed with one of the Five Keys. You will find some clues in the table on page 8 called the "Five Keys to Recovery from Depression." On the next page of your notebook, summarize your observations by making a heading for each Key and listing the things you circled in your story. Try to match the problems with the Key. Title this exercise "My Problem List." How do you feel when you look at your problem list? Do you have a sense of accomplishment that you have made some progress in recognizing things that can be changed? Are you optimistic that something can be done to turn your situation around? Or do you feel a bit overwhelmed? It's a normal reaction to see a list of problems and to think that the road ahead will be difficult. But, one of the big pluses of accurately identifying problems is that you'll have a much better chance of finding solutions if you know exactly what is bothering you. When we begin therapy with our patients, we usually ask them to pick one or two problems they can work on right away. Even before they have had a chance to learn everything they would like to know about the Five Keys, we want them to feel a sense of accomplishment. The program described in this book is similar to therapy in that it takes time to fully understand your problems, organize a plan for recovery, and implement the plan. However, there are some basic problem-solving techniques that you can use now to tackle some of your difficulties and begin to get some relief. Here's how to get started. Review your problem list and rate each item for its degree of difficulty using the scale in the box below. A score of 1 suggests that it would be fairly easy to make some headway toward managing the problem. A score of 5 suggests that it would be extremely difficult for you to make any significant progress toward solving this problem at this time. If all your items are rated a 4 or 5, you're probably only thinking about the big changes you have to make. Add to your list the smaller challenges, problems, and annoyances that need attention. Try to place them under the Key you think might be most helpful. Don't worry about matching the problem and the Key exactly. There will be plenty of guidance ahead on how to best approach your various problems. Of the problems you rated as 1, 2, or 3 in difficulty, choose one or two that you think you could make some progress on in the next few weeks. Circle these in your notebook. Next, make a list of ideas for managing the problems. These may be things you have thought about doing, but have not had the time or energy to try. Choose the solution that you think has the greatest chance of success and give it a try. You'll find that if you can make a small amount of progress, it can lighten the emotional burden you carry on your shoulders. Michelle used this same problem solving exercise early in her therapy. When she was asked to rate her initial problem list for degree of difficulty, she gave them all a score of 4 except for "becoming distant from the kids," which she thought would be easier to change. She gave that problem a rating of 2. Because Michelle had some excellent ideas on positive changes that could be made and was ready to take some action to improve the situation with her children, we decided that this would be a good place to start. Michelle's plan for beginning to do things differently with her children included the following: (1) Try to have an evening meal together with children at least four times a week, (2) After dinner, talk with kids about school or the other things that are going on in their lives, (3) Spend some time helping with homework or reading to children each weekday. In the past, Michelle had done many of these things routinely. So, when she spotted the problem and started to do something about it, she began to feel encouraged. Try to follow Michelle's lead in using problem solving to get started toward recovery. If you can take at least one step in a positive direction now, it should boost your optimism and help prepare you to use the Five Keys to overcome depression. This initial effort to solve a few problems is just the beginning of an overall plan for feeling better and getting your life back on track. In the next chapter you will start to build your Personal Plan for Recovery by measuring your symptoms, setting workable goals for improving your life, and figuring out what strengths you have to battle depression. As you read further you will learn about each of the Five Keys and will discover new ways to control your symptoms, solve your problems, and reach your goals. Sometimes progress can be slow at first, but your efforts should pay off as you put in more time and effort. If you start to feel discouraged along the way, skip ahead to Chapter 6 and read about ways to increase your patience and persistence. Michelle was so upset when she began treatment that she had a hard time staying motivated. Her logical mind told her that she had the ability to make things better for herself, but her sad and anxious emotions kept undermining her confidence. To make herself hang in there even when she wanted to give up, Michelle learned to rely on two of her greatest strengths -- her ability to dig in and work hard even when she dreaded the task, and the support of her friends. When she felt like throwing up her hands and giving in to her misery, Michelle called her two best friends to ask for help. They did their best to encourage Michelle by reminding her of her usual tenacious spirit and the successes she had in the past. If that didn't work, Michelle told herself, "I've just got to do it. I don't have the luxury of giving up on myself. My kids need me. I have to at least give it a try." After she overcame depression, we asked Michelle to tell about how she got better. "If you keep working at it, you can find a way to conquer depression. For me, it was learning how to stop thinking so negatively and acting so lost and helpless -- and using a medication that really helped. My family and friends were terrific. They stuck by me when I needed them. In the beginning I thought it would be impossible, but I did learn to solve my problems." Michelle eventually realized that there could be many ways to lead a satisfying life without being married to her husband. Michelle's long-term goal was to get beyond the divorce to reach the point where her life had clear direction and purpose again. She was optimistic that better days would be ahead. What do you think your chances are of getting better? Do you believe that there will be answers to your problems? Do you have a hopeful attitude about the future? Hopefulness can be one of the most significant influences on your progress toward recovery. People with a hopeful view about change are usually willing to try new things. But if you suffer from hopelessness, you may give up too easily or not give good ideas an opportunity to work. Think for a moment about the effect of hope on your behavior. If you don't believe that any of your efforts are likely to make a difference, how hard will you try to change? On the other hand, would you act differently if you had faith in yourself to get beyond your difficulties, or even reach a higher plane in life? While a positive mental attitude is clearly helpful, it can be hard to come by when you are feeling down. There can be a "vicious cycle" in depression in which you lose your desire to take action. When you do less to get out of your rut, to spend time with those who love you, and to solve your problems, it is easy to become more discouraged about the future. Hopelessness feeds the depression, which slows you down even more. The way out of depression is just the opposite. A "positive cycle" can develop when you find some reasons for hope, and either change your attitude or change your actions. After you take some positive steps, your mood lifts and your energy starts to return. You'll probably find that it's hard to make yourself feel more hopeful until you have a reason to feel that way. So you will have to take a few steps toward fixing your problems before your optimism returns. For some people, this positive cycle keeps going even after the depression goes away because they have developed new skills, healthier habits, and better attitudes. These positive life changes help them to be stronger overall than they were before and to find greater meaning and purpose in their lives. Jeff, the teacher described earlier in this chapter, was able to lead a much more fulfilling life after he stopped comparing himself with others and began to pay full attention to family relationships and the other things that really counted for him. We want to stop now to ask you these very important questions: What gives you hope? What keeps you going? Each of us has a unique response to these questions. But some of the common answers we have heard are: "My family, I would never want to leave them," "I know I can get better," "I really love life when I'm feeling well," "For me...I have lots of things I still want to do," "My faith keeps me going," and "I have a contribution to make in life." Get started -- do the problem-solving exercise outlined in this chapter. Learn about the treatment of depression by reading this book or talking with a doctor or therapist -- recognize that depression is a common illness that responds very well to therapy. Ask someone you know well about your situation. If they are supportive and tell you that things will get better, try your best to believe them. Remember that depression makes you focus on the negative and sometimes miss the positive. You can fight hopelessness by paying more attention to the positive things that happen in your life. These could be small things like seeing your children smile, finding a good parking space, or taking time to savor a special meal; or bigger things like completing a project, getting a raise, or making a new friend. As you work through the exercises in the rest of the book, you should be able to identify more reasons to have hope for the future. For most people there are numerous possibilities for coping with difficulties and finding ways to get their lives back. After you write down your current reasons for hope, you can go on to find out more about how the Five Keys can be used to target your problems and find solutions. Mike Maza The Dallas Morning News Refreshingly global...Straightforward about coping with everything from suicidal thoughts to lingering blues.